General McLane Lancer Wrestling. All About the Lancer Wrestling Coaches. Head Coach, Ryan Cook took over the helm for Tim Mulholland, who retired at the end of the 2003-2004 season. 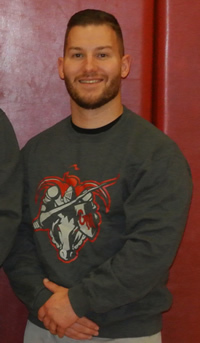 Coach Cook was the Assistant for three seasons and was instrumental in developing a winning attitude among the McLane wrestlers. He was selected the District 10 "Junior Varsity Coach of the Year" in 2002-2003 and led the GM JV team to an unbeaten record and top finishes at the Corry and Maplewood Tournaments. Mr. Cook is from Massena, N.Y. where he compiled a 95-15 career wrestling record in high school. He was a 3 time state qualifier, 4 year team captain and a 4 time team "Most Outstanding Wrestler." 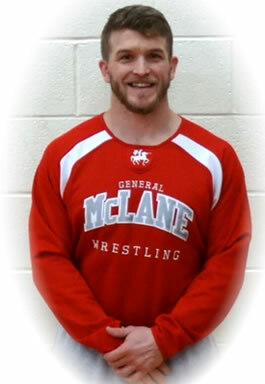 He is also a former Edinboro University Wrestler and graduated with a B.S. in Environmental Studies. In his 15 seasons at the helm, Coach Cook has compiled a 192-69 dual meet record (a 73.56% winning percentage). His 2004-2005 team won the Salamanca and Redbank Valley tournaments, and took second place at the Tool City and District 10 post-season tournaments. During the 2005-2006 campaign, his team placed 4th at Tool City and third at the Seneca Valley tournament. They were crowned District 10 Team Duals Champions and District 10 Tournament Champions. In addition, Cook was honored as the District 10 AAA Coach of the Year! The 2006-2007 team won the District 10 AAA Tournament and posted 13 wins. Coach Cook's teams also won back to back Mountaineer Invitational Tournaments in 2009 and 2010. In 2011 his team won the Jarvis Wildcat Memorial Tournament. In 2012-2013 Coach Cook's team finished the regular season at 15-0 (16-1 overall), won the Tool City and Fred Bell Tournaments, as well as the Clearfield Duals, the Region 4 AAA title and the District 10 AAA Tournament title. Coach Cook was also named the District 10 AAA Coach of the Year for the 2012-2013 season. The Lancers also took runnerup honors at the NW Regional AAA Tournament in Altoona. The 2013-2014 team were Region 4 AAA Co-champions and they won the NW Regional AAA Tournament team title. The 2014-15 season was one of the best in McLane wrestling history. The team's overall record was 17-3. All 3 of those losses came at the hands of state ranked teams. The team made history by winning their first ever match at the state team duals. They also won the Region 4 AAA crown with a spotless 9-0 record. They won the Tool City and Fred Bell tournaments, the Clearfield Duals, the District 10 Duals and the District 10 AAA tournament title. They capped it off with a runnerup finish at regionals and qualified a record 7 wrestlers for the state tournament. The 2014-15 season also saw Coach Cook surpass Coach Mulholland and become the winningest coach in GM wrestling history. The 2015-16 team was crowned Tool City and Fred Bell Tournament Champs and Region 4 Co-Champs! The team moved back to AA in 2018-19 for the first time since 1982-83. They won the Region 4 title with a perfect 7-0 record, the Section 1-AA title and placed 3rd at the District 10AA Tournament. Mr. Cook has coached 3 section champions (2019), 39 District X champions, 130 District 10 placewinners, 9 NW Regional champions, 58 NW Regional placewinners, 40 state qualifiers, 7 state placewinners and 2 state finalists. During the off season he also coached 7 National Folkstyle Champions and 27 National Folkstyle Placewinners. Coach Cook's experience, innovation and enthusiasm are an asset to the General McLane wrestling program. (updated: 3-08-19. Stats through the 2018-2019 season). 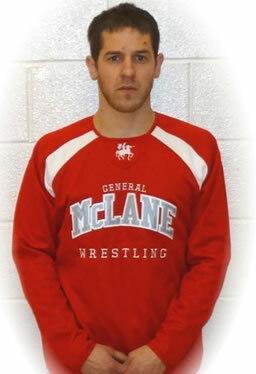 Chris wrestled at General McLane from 2010-2014. He was a 4 year letter winner, 2 time District 10 champ, 2 time state qualifier and posted 112 career wins. He is a junior at Edinboro University where his major is Geology. he is the son of Phil and Lisa Laird, brothers are Nate, Ethan and Chuck. Patrick went to Longwood High school in New York where he was All-State-2011. He was also a 2 time Virginia Beach All American - 5th as a junior and 6th as a senior. He was a four-year starter for Edinboro, was PSAC champion his senior year, and a PSAC 3rd placer as a freshman. He was also a 3-time EWL place winner. His brother, Eddie wrestled for 2 years at Edinboro and his older sister was a four year varsity swimmer for Binghamton university. He graduated from Edinboro with a bachelor's degree in English and is working on his masters degree in Secondary Education. Sam went to high school at Lyndonville. He finished 2nd at the Eastern States Classic his senior year. He went to college at Edinboro University. He majored in Human Performance with a minor in coaching. He was a 4 year wrestler at EU. His sophomore year when Mitchell Port was injured for a week, he had to fill in and started in a dual meet at Virginia Tech University and wrestled Devin Carter at 141lbs. 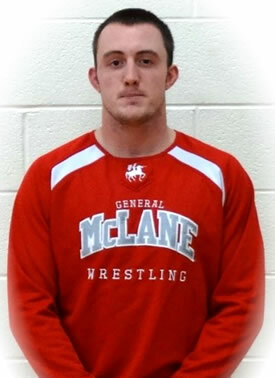 Brandon is a 2006 graduate of General McLane where he was a four-year letterman on the wrestling team. He was a member of the 2002-2003 and 2005-2006 teams that both captured the District 10 Team Title. He won the 130 lbs. District X AAA Championship as a senior while being named 1st Team All Region. He went on to graduate from Slippery Rock University with a Bachelor of Science degree in Exercise Science. He then attended The New York Chiropractic College where he attained his Doctorate in Chiropractic Medicine. He practices in Erie, PA as the primary Doctor at Maximal Gain Chiropractic Center. Saraceno took over as head coach of the middle school program in 2017. His team posted a 9-2 dual meet record, were the Burrell Duals runnerups and the Ed Margie Tournament Champions. Saraceno was named the District 10 AAA Jr. High Coach of the Year for the 2017-2018 season. DJ graduated from General McLane in 2012. During his career, he accumulated 124 career wins and was a District 10 and Northwest Regional champion in 2012 at 152 lbs. DJ was on the Mercyhurst wrestling team and graduated in May of 2016 with a Bachelors Degree in Exercise Science. He is the son of Doug and Laurie Myers along with 2 brothers, Doug and Dylan, and 2 sisters, Danielle and Dayna.